Check out MagsDirect.com for magazine subscriptions. Today we are back to the grind ... and after having both Thursday and Friday off, that big iced coffee was MUCH needed this morning! First things first: I am going crazy over the fact that I have all of these fab photos from our Europe trip that I still haven't shared - it's officially been a month since we returned so that's just not acceptable! I'm making it official that I will be posting them this week (France, Switzerland) and next week (Italy), so there. Written in stone -- sort of. On to a few weekend highlights! 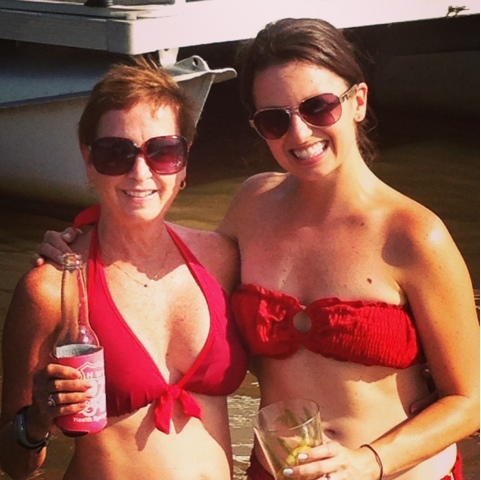 We spent the 4th with my family down at the lakehouse, and man did we have fun. 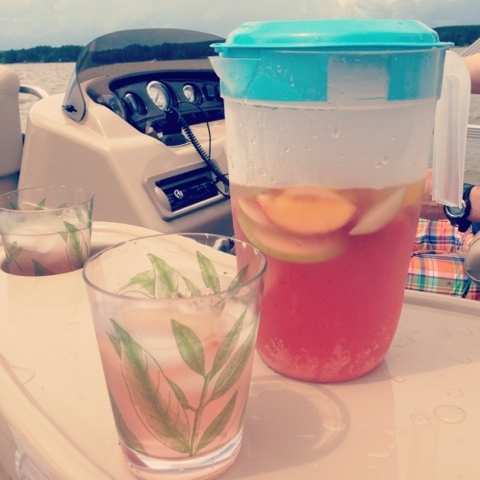 Thursday we dodged the rain and took the boat down to The Sandbar and just relaxed there. I made sangria -- one of my best batches yet! I used pink moscato as the base, which is way too sweet for me to drink on its own, but yummy for sangria. Friday, we returned to Charlotte and laid low for the evening. Saturday afternoon we went to an engagement celebration up at Lake Norman. 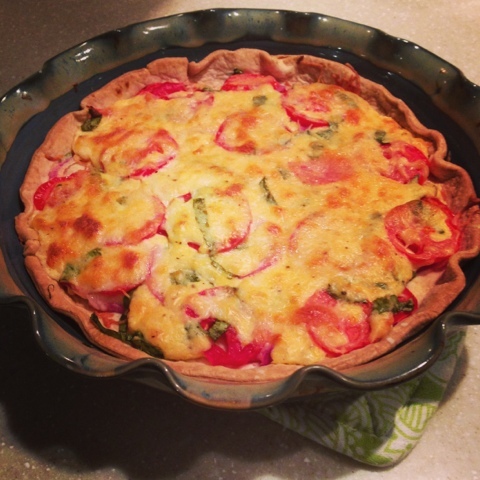 And Sunday was filled with home chores and a yummy supper -- the tomato pie was a true standout! More to come on this yummy dish. I hope you had a great weekend ... stay tuned for Europe pictures (finally!). Ciao! Looks like a great weekend! I can't wait to see your pictures from Europe! Sounds like a nice weekend! Looking forward to Europe pictures! It's official. YOu and your sisters just have good genes. Your Mom is smoking hot! I agree with Dee! Also-great running into you at the Y. I need to fill you in on the creepy older man that I encountered there! I have never made sangria with pink moscato sounds delicious. Can't wait to see pics of Europe! YUMM that tomato pie looks delicious! Please post the recipe! I want to know more about the pink moscato sangria!! Also, I am dyyyyyying for the Europe pictures!!! can't wait for 1. the pics and 2. the tomato pie recipe! Ohhh my goodness tomato pie will we always have a special place in my heart not many (evensoutern) know what it is!